Sunshine, cheap drinks, and a load of blokes who are convinced they are ‘Don Lads’ – what could possibly go wrong? Well, the combo was all too much for these tourists as a mass brawl broke out in the Spanish resort town of Benidorm, with the Daily Star claiming the men in the video are British. 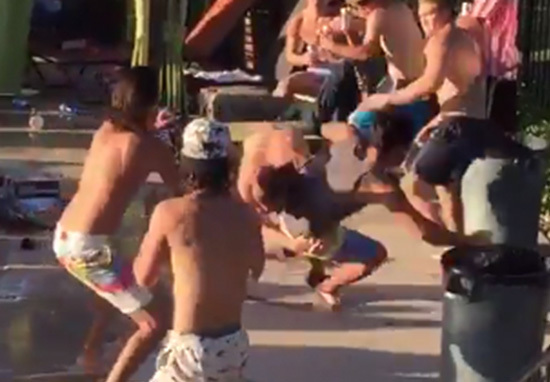 Things escalated rapidly after one holiday-maker took a swing at another, and before you know it the pool scene was basically transformed into Benidorm’s answer to WWE’s Royal Rumble. Bill Goldberg would have been pleased with the execution of that ‘Spear’, and the bloke who was sent flying into the pool with one punch is still probably trying to work out what day it is.